Whether you should refinance your student loans is a hot topic. They’re now the second largest type of debt behind mortgages, with $1.25 trillion outstanding. The average student loan balance is about $37,000 per graduate. If you’re slowly chipping away at student loan debt, consider if you should refinance to a lower interest rate. That’s one way to save money and pay it off faster. Both federal and private student loans can be consolidated into one loan that’s less expensive and more convenient. Here are some pros and cons to help you know if doing a student loan refinance is right for you. Free Download: Online Loan Comparison Chart – a handy PDF resource to compare the best lenders for refinancing student loans. The main benefit of refinancing federal and private student loans is the potential to save money over time. According to SoFi, a marketplace lender that offers a non-traditional underwriting approach, refinancing saves their members $14,000 on average. If you have multiple federal and private student loans, you can refinance and consolidate into one convenient payment. Often, the refinance process can be completed online within a week, with no application or loan processing fees. Although a few lenders offer remarkably low interest rates, the qualification criteria are often selective. Most lenders take into account your credit score and debt-to-income ratio to approve your student loan refinance application and set your interest rate. If your credit isn’t good or excellent, you may have trouble getting approved. 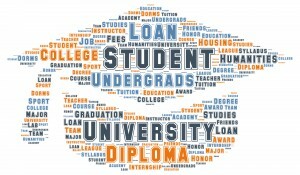 In addition, lenders look for candidates who have student loans in good standing. If you’ve missed payments, you’ll likely have trouble qualifying for a refinance. Some federal student loans also qualify for programs like Teacher Forgiveness and Public Service Loan Forgiveness, which forgive a portion of your loan if you serve the community for a certain amount of time. In this case, you’ll likely benefit more if you keep the loans and meet the program requirements than if you refinance. SoFi is a trailblazer in the student loan refinance market. They offer variable interest rates starting at 1.9% APR and fixed interest rates from 3.5% APR, depending on your credit. For long-term loans, you’ll come out ahead by locking in a low, fixed rate. But if you can pay off a student loan refinance quickly, consider an even lower-rate, variable loan. Upstart loans start at 4.66% APR for a 3-year term. What makes Upstart unique is the way they qualify applicants. They look beyond your credit and also use criteria such as your education, area of study, academic performance, and work history in their approval process. LendingTree is a loan marketplace with one of the nation’s largest networks of lenders. They include national, regional, local, and alternative lenders that offer a variety of loans, including student loans and refinances. Student loan debt is a major hardship for many graduates, so refinancing is definitely something you should look into. It’s possible that you could substantially lower your monthly payments. But a refinance isn’t a solution if you’re currently struggling to make payments, especially if you have federal loans. Review your options carefully and make sure you understand the benefits of keeping your federal loans before you go through with a refinance. You can learn more about the options to refinance your student loans on the U.S. Department of Education’s Federal Student Aid website.